Miller interviewed some people familiar with the area, and heard tales of “cataclysmic floods” and such. He sliced samples from the trees along the edge of the old growth and saw signs of blunt trauma. He left Alaska still contemplating hypotheses, and he ended up writing a paper putting forward some possibilities. But the origin of the distinct damage would remain a geological mystery until five years later, when humans had the unsought opportunity to witness the cause of the terrifying phenomenon firsthand. If one likens the shape of Alaska to a bearded human face in profile, Lituya Bay is somewhere near the Adam’s apple. It is a long, narrow, T-shaped, glacier-carved notch about eight miles long and two miles wide (13km by 3km), bordered on its west end by the Fairweather mountain range. It is unusually deep, and a small island lies near the very center. From a distance, the bay appears to have a wide mouth, but a narrow strip of land called “La Chaussee Spit” drapes across most of the opening, leaving the actual inlet only 1,600 feet (490 meters) wide. The bay was first discovered by Europeans in 1786, by the sailors of French vessels named the Boussole and the Astrolabe. Commodore Jean François de Galaup, comte de Lapérouse commanded a stable of astronomers, mathematicians, geologists, botanists, physicists, naturalists, mineralogists, and illustrators on a scientific expedition to the lesser-known limbs of the world to fortify France’s body of worldly knowledge. The ships were following in the figurative footsteps of famed explorer James Cook, to clarify and complement his earlier discoveries in the Pacific Ocean. The bay must have left an impression on Lapérouse, because in a dispatch sent back to Europe he named it for his homeland—Port des Français: the Port of France. Lapérouse deployed men in small boats to explore the bay, and they encountered a treacherous peculiarity as they approached the bay inlet. The pinched, shallow channel amplified the tidal current severely, and the boats were upturned by the unexpected force. About twenty men disappeared into the water, their bodies never found. Subsequently Lapérouse christened the bay’s solitary island Cenotaph—a word referring to an empty tomb or monument. Lapérouse and his expedition left Alaska to continue their exploration of the Pacific, sending dispatches back to France describing their findings. But after departing from Australia’s Botany Bay in March 1788, no member of the expedition was ever heard from again, despite an earnest search and rescue campaign sent from France. In the subsequent decades there were rumors that a pair of ships had been dashed upon the shallow coral reefs around the island of Vanikoro, but it would be almost two centuries before wreckage of Lapérouse’s ship the Boussole was found there to confirm it. Lapérouse’s name “Port of France” didn’t stick, despite his mysterious, heroic disappearance. By the 1930s, the remote Alaskan bay was known as Lituya, a word meaning “lake within the point” in the native tongue of the local Tlingit tribe. The Tlingit people had a legend about Lituya Bay, one describing a monster who lived near the entrance of the bay, provoking enormous waves by grasping the water and shaking it like a sheet. Metaphorical monster notwithstanding, Lituya Bay became a common stop for fishing boats, as it was the only refuge from nature to be found for a hundred miles. As long as sailors were aware of the strong tidal current near the inlet, there was little known cause for concern. Although the cause of the recurring destructive disturbances in the bay was a mystery, a few people had witnessed the effects. In the early morning of 27 October 1936, Nick Larsen and F. H. Frederickson were at anchor in Lituya Bay on their troller The Mine, having spent the night there. At around 6:20am local time, the men reported hearing a loud, continuous roar begin to emanate from the inland end of the long, narrow bay. They squinted toward the source of the sound, but it was still dark out. This confusing cacophony continued for around thirty minutes before the men sighted the cause of the great white noise: a wave about fifty feet high on a collision course with their vessel. It was strange for a large wave to be coming from the direction of land rather than the open ocean, but the men had no time to contemplate such details. Without further ado they pulled anchor and started the engine. The fishing boat lacked the speed to escape the bay before the wave arrived, but they thought they might be able to take cover behind Cenotaph Island. As Larsen and Frederickson reached the west side of the island, putting it between themselves and the approaching wave, they found another boat anchored there. The neighboring boat belonged to James Huscroft and B. V. Allen, who were both asleep in a small cabin up the shore. As the wave arrived, the men in the cabin were awakened by a roar that one of them later likened to “the drone of 100 airplanes at low altitude.” When they looked outside, they were surprised to see the ocean at their doorstep, and rising fast. Huscroft and Allen hustled to higher ground, and watched as three consecutive waves slowly swept from the inland end of the bay out to the ocean, about two minutes apart, each larger than the last. The cabin was drenched, but still standing. Down at the shore, the hull of their anchored boat clanged against the rocky floor of the bay behind the passing waves. No humans were injured in the apparent tsunami, but a few small structures were crushed and countless trees were uprooted. Later inspection would find that the water had sloshed as high as 490 feet (150 meters) up the shore. Once the water settled, Frederickson maneuvered his troller through the floating tree debris to the inland end of Lituya Bay, but he found no evidence of any massive event that might have triggered such a series of waves. When petroleum scientist Don Miller arrived at the remote Alaskan bay 16 years later and observed the trimline from the 1936 waves, it aroused his geologic curiosity. The 1936 event had been locally newsworthy, therefore long-time residents of nearby towns were readily able to retell the tale. Other geologists had concluded that the waves were probably caused by a large mass of water suddenly dumped into the bay when an ice-dammed lake broke free, but Miller found that the local topology topography didn’t support this explanation—unless there happened to be a concealed chamber under a nearby glacier. He investigated some other possibilities, such as rock falls, underwater rock slides, glacier movement, and earthquakes, but he could not find conclusive evidence for any. On the evening of 09 July 1958—six years after Don Miller’s initial visit to the region—Lituya Bay was serving its typical role as a refuge for trollers. Earlier in the afternoon, the bay had been relatively bustling, with a large group of climbers camping on the shore, but they had departed suddenly due to their pilot having worries about fog. By 9:30pm the sole occupants of the bay were three forty-or-so-foot-long fishing vessels bobbing quietly in separate nooks near the bay entrance. One of the trollers was the Badger, occupied by Bill and Vivian Swanson, anchored about two miles from Cenotaph Island. At that northerly latitude at that time of year, the sun was just beginning to set despite the late hour. Consequently, when the silence was shattered by a squawking pandemonium, the Swansons were able to see its cause: the thousands of gulls that nested on the steep slopes of Cenotaph Island had all noisily taken to the air to exit the bay. This was not typical bird behavior. After a few minutes, the stillness returned. The Swansons, slightly troubled, decided to turn in for the night. About 45 minutes after the rapid unscheduled avian migration, at 10:16pm, a deep rumbling shook the earth, and the water of Lituya Bay began to splash and seesaw. The nearby Fairweather Fault was slipping. This was the biggest earthquake the area had seen in fifty years, approximately magnitude 8. Across the bay, father and son Howard and Sonny Ulrich were asleep in the troller Edrie when they were shaken awake. Ulrich said later he was only able to stare, transfixed, as the rocky mountainscape chattered, clouds of dust rising and mountainsides sloughing. Husband and wife Orville and Mickey Wagner were in the third fishing vessel at anchor that night, the Sunmore. Unlike the others, amid the shaking, they immediately started the engine, pulled anchor, and steamed for the bay’s narrow exit. The earth shook for anywhere from one to four minutes—eyewitness reports varied. When the fault finally came to rest, the foamy water of Lituya Bay settled back into something resembling its ordinary lazy waves, and a new quiet blanketed the bay. Despite the cessation of shaking, Orville and Mickey Wagner on the Sunmore—the boat headed for the bay exit—continued their retreat toward the open ocean. After a minute or so of apparent calm, a crash described as “deafening” rattled the atmosphere. One of the unnamed mountain peaks that stood at the inland end of Lituya Bay had broken off, dropping ninety million tons of rock into the water with the force equivalent to a meteor strike. The resulting impact shook loose other rocks on the slopes, and chunks of adjacent glaciers, and these plunged into the water practically all at once. Millions of cubic yards of displaced water heaved upward and formed a wave traveling outward at about 110 miles per hour (180 km/h). Within about a minute, the approaching wave became visible to the boats still at anchor, and the occupants looked on in awe as the wide skyscraper of water traversed the length of the bay towards them. When it reached Cenotaph Island another minute or so later, the proportions of the wave became clear. The center of the wave was almost as high as the highest point on the island, 300 feet in the air. On the two opposite shores, the plowing saltwater reached over 1,700 feet (over 500 meters) onto land, twisting even the most massive trees from their roots and scraping the bedrock nearly clean. Broken trees scattered on shore after the wave passed. Photo by Don Miller. On the other boat still at anchor—the Edrie—the sight of the massive, debris-filled wave bearing down on his position snapped Howard Ulrich out of his astonished daze. “I began to move then,” he would report in a later interview. “And I moved fast, cursing myself for not moving sooner.” He lashed a life vest around his eight-year-old son and started the engine. Ulrich attempted to raise the anchor, but it wouldn’t budge. Evidently during the shaking the rocks on the floor of the bay had shifted, jamming his anchor in place. Having no better option, he reversed the anchor chain feed and dumped his forty fathoms of slack into the water, then turned his boat toward the wave. The wall of water lifted the bow of the Edrie almost straight up into the air. The anchor chain snapped. Ulrich snatched up the radiophone and shouted into it, “Mayday! Mayday! This is the Edrie in in Lituya Bay. All hell has broken loose in here. I think we’ve had it. Goodbye.” The wave carried the Edrie and her crew of two up the shore as the water beneath them ripped trees and vegetation from the soil. It then dragged them back again toward the center of the bay. After considerable spinning and lurching, the boat ended up upright and relatively undamaged in the sloshing wake of the wave, amid thousands of bobbing, uprooted spruce and hemlock trees. The Edrie’s occupants were shaken but uninjured. An errant tree smashed the Badger’s pilot house, breaking several of Bill Swanson’s ribs. The wave carried the Badger all the way over the spit and plopped the vessel stern-first just offshore in the open ocean. The boat hit bottom, bobbed back to the surface, and promptly began to sink again as it took on water. Bill and Vivian were rattled and bruised, but mostly intact. In the darkness, husband and wife deployed a small skiff they had on board, and abandoned ship. The water of Lituya Bay sloshed back and forth for another thirty minutes, surging from shore to shore as the remaining energy dissipated. A layer of bobbing logs, chunks of ice, mud, and other detritus covered much of the bay and stuck out into the ocean like a tongue. Ships that had been in the area outside the bay arrived to help hunt for survivors in the debris as the sun set. Around midnight one of the search vessels located Bill and Vivian Swanson huddled in their skiff in their skivvies. Some of Don Miller's photos cataloging the destruction. Don Miller—the petroleum geologist who had been interested in the odd trimlines six years prior—returned to Lituya Bay shortly after the 09 July earthquake, taking photos of the damage from the ground and the air, and cataloging possible causes. Evidence of heavy water damage reached 1,720 feet (520 meters) up the shore, the earth stripped down to the bedrock for much of this area. For reference, if One World Trade Center were submerged in 1,720 feet of water, only the tip of its spire would remain above the waterline. The trees that still clung at the edges of the trimlines were heavily damaged, with most of their bark stripped away. Trees as large as four feet in diameter had been bent and snapped from the slopes. The wave had carved a channel through the middle of Cenotaph Island, and La Chaussee Spit was scrubbed down to the rock. This wave had reached over three times farther up shore than the previous large waves in the bay, and therefore had obliterated all evidence of the prior events. Miller’s detailed report on the event essentially concluded that the long, deep, narrow bay constituted a “hydraulic oddity” predisposed to enormous waves, and that ninety million tons of rock falling suddenly into it made for a quite compelling demonstration of Archimedes’ principle. All told, five people were killed by the earthquake and subsequent wave in Lituya Bay. Two of the deaths were the Wagners, who had tried to flee Lituya Bay aboard the Sunmore; they were never seen again. The other three deaths occurred eighty miles north, on a beach on Khantaak Island. When the Fairweather fault moved, the beach rapidly subsided under the ocean, and the three people there disappeared into the waves. The cabin on Cenotaph Island was completely swept away, a lighthouse was destroyed, and numerous other structures damaged, but the remoteness of the area prevented a greater human catastrophe. At 1,720 feet up the shore—about a third of a mile—the 1958 Lituya Bay event was several times higher than the previously recorded maximum height of a tsunami breaking on an ocean shore. Because this tsunami was an order of magnitude larger than typical tsunamis, and because it was caused by displacement of earth and ice rather than an earthquake, a new term was coined to differentiate it: megatsunami. Similar rockslide-related surges have been observed in a handful of other places in the modern world, some of them much more deadly. In 1883, when Krakatoa erupted, geologists believe that the resulting tsunami was caused when a dense mass of hot ash, lava, and gases—a phenomenon known as pyroclastic flow—displaced the water in the Sunda Strait. 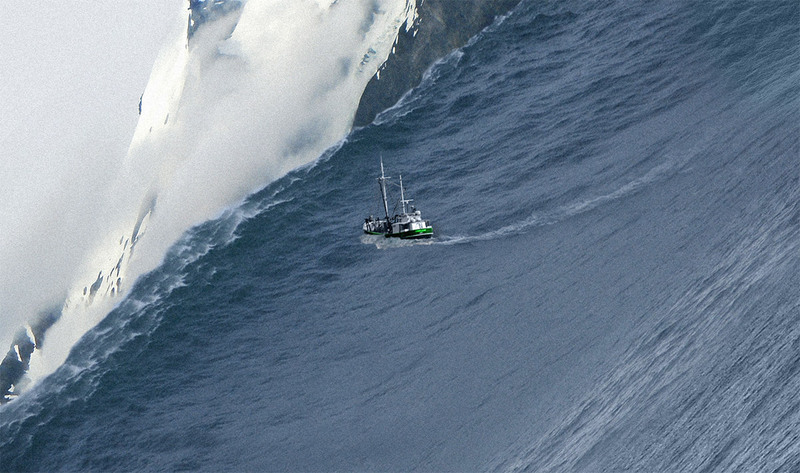 Waves as high as 138 feet (42 meters) reached the west coast of Java. And five years after the Lituya Bay megatsunami, in 1963, there was a landslide upstream of Vajont Dam in Italy, producing an 820 foot high (250 meter) surge. It was only half as high as the Lituya Bay surge, but when it overtopped the dam it inundated five villages, killing almost 2,000 people. Geologists have also identified multiple potential future megatsunami sites where unstable rock rests above deep bodies of water—on the slopes of volcanoes in Hawaii and the Canary Islands, and on craggy rock faces in British Columbia and Cape Verde Islands. It’s impossible to know when, if ever, these rockfalls will occur, and if they do, exactly how catastrophic the resulting waves would be. But they are cause for concern. Lituya Bay days after the 1958 megatsunami. In this image, a troller near the bay inlet would be no larger than a pixel. The 1958 Lituya Bay megatsunami remains the highest such wave in recorded history. As of 2016, no subsequent megatsunamis have been observed in that location. But evidence for multiple prior events in Lituya Bay suggests that giant waves occur there every 30-40 years on average, so the 1958 event is quite unlikely to be the last. The area remains sparsely populated, but trollers and adventurers pass through frequently. Anyone planning a visit to this remote hydraulic oddity ought to consider: if the gulls of Cenotaph take suddenly to the air, or a roar akin to 100 airplanes rises in the distance, you might be in for a harrowing spectacle few humans have lived to see. An earlier revision of this article erroneously translated ‘Lituya’ as “no lake within.” We also erroneously referred to the fishing vessels as ‘trawlers’ rather than ‘trollers’ in a few places. Written by Alan Bellows, copyright © 30 September 2016. Alan is the founder/designer/head writer/managing editor of Damn Interesting. Podcast sound design by Alan Bellows. Podcast narration by Alan Bellows. Last updated 07 January 2019. An amazing story. I commercially fished salmon in SE Alaska for 6 seasons and had the opportunity to spend a few nights in Lituya Bay, an incredibly remote and awesome place. This is basically the only place to find shelter from the open ocean between Cross Sound and Yakutat. This story was on my mind each night we were anchored up in there. FYI, trawlers drag nets, trollers drag hooks. The boats in the photo in the article are trollers, not trawlers. I thought that the actual boats that were there on the night of the wave were also trollers. I’m not positive, but I suggest you double check that part. Thank you very much for this wonderful story about one of the fabulous movements which periodically arise from within our beautiful planet. Also, the article seems to blur the distinction between the distance waves sweep inland and the height of the wave — Waves on the ocean beaches of North America routinely sweep 20-to-30 feet up the beach, but clearly aren’t 20-to-30 feet tall when they do so. While the 1958 wave may have swept over 1700′ inland, it seems to have been “only” 300′ tall if it was truly as high as the highest point on Cenotaph Island. Judging from that picture of the aftermath, though, the trees on the island seem to still be standing, in contrast with those on the shores of the bay, leading me to question whether the island was really swept over, or whether the waves crested much higher on the shores than they did in the center of the bay (gradual underwater slopes tend to magnify wave effects, compared to steeper slopes). I’m hazy on the technical criteria for “Megatsunami” status (height or distance), and obviously this was a massive and destructive phenomenon, even if “only” 20 or 50 or 100 feet tall. But it does no good to hype it as orders of magnitude larger than it was. Gway is right. The boats in question are trollers, not trawlers. Lovely article, as always. I just want to point out that Port des Français would literally mean Port of the French (the people), rather than of France (country/nation). god what ever happened to the crew? I feel angry about the loss about the crew unless they lived. Very interesting article. I had heard bits and pieces of this story growing up as my grandparents were fishermen and actually wound up with Mickey and Orville’s house in Idaho Inlet. I spent most of my summers there when I was a kid. Also remember the Swansons from Elfin Cove. What an awesome and horrifying event! I was in Alaska at that time as a military dependent , but don’t recall feeling any shaking or tremors at Fort Richardson. I was 10 or 11 years of age then . We had other natural occurrences that I remember. My parents, gramma and brother and I were driving along the Yakutat road from the airport to town. Dad stopped the car and we all got out. He told us kids to stop shaking the car(which we were not doing). Later we learned that our CAA neighbors, the Tibbles, were lost on Khantaak Island. I have been in Lituya Bay; I am confused about the Sunmore. But first, Mr. MacGuffin, you misunderstand something. The trees were swept off the mountainsides to an ELEVATION of over 1,700’above sea level. That is far different from your assumption that the waves swept INLAND 1,700 feet. Looking at the photos, that mark was achieved back in the head of the bay where the mountainsides are extremely steep. You do raise a valid point about Cenotaph Island, though. In the photo it does appear that the trees are still intact there as opposed to the ones on shore. However, the scale of the photo is too small to tell just what we are looking at. And further, are we sure the caption is correct as to the date? My understanding is the wave started off as tall as stated, but as it approached the mouth of the bay, its amplitude had reduced from “unimaginable” to just “terrifying”. Bottom line, I don’t think the author of this article, nor the other accounts I have read, are overstating anything. Back to the Sunmore. If it left early, why did it not survive? Presumably, they made the mistake of allowing the wave to take them on their stern. The two surviving boats apparently took the wave on their bow. So even though they reacted more quickly, their boat was not fast enough to exit the bay before the wave hit. It is too bad that they did not conclude escape was futile and turn their boat to face the wave at the last instant. However, I can’t really fault anyone for their actions under these catastrophic circumstances. I wouldn’t have expected any boats to survive, and question whether I would be able to do anything other than raise the alarm by emphatically knocking my knees together in that time of crisis. Wapi: Which “crew” are you referring to? There are references to 3 boats sunk in different times in the article. In all three cases, no bodies were recovered. They were lost in the turbulent ocean that killed them. I have experienced two minor earthquakes here in Central Ohio, and they produced very odd sensations. I can’t begin to imagine what that earthquake felt like. Is this a paper back book I can buy or is it only online?? The crew of the French exploration ship were likely lost attempting to navigate the entrance into Lituya Bay on a big tidal runout during a period of a big ocean swell. I am sure the mother ship was standing well off the coast and probably didn’t have visual communications with the launch. Tendering the Copper River Flats for 20+ years if anything I learned when running the bars timing was everything. An observer at Lituya Bay would see the sun would set over the ocean, as the mountains lie to the east. @Ray Caruso: Hmm, I suppose it depends on one’s location at the time of observation. Due to the way Lituya Bay is situated, an observer on the spit would see the sun set over the ocean, but someone at the opposite end would see it set over a mountain. Nevertheless, you are *more* correct, especially since that section of the text largely centers around people entering the bay from the mouth. I have updated the text accordingly, thanks for the correction. Most beautiful yet eerie anchorage I have ever taken shelter in. Prior to anchoring here my father in law loaned me a book titled, Islands in the Mist . This book made me understand the history of the bay, yet scared the daylights out of me. Had several restless nights on anchor.